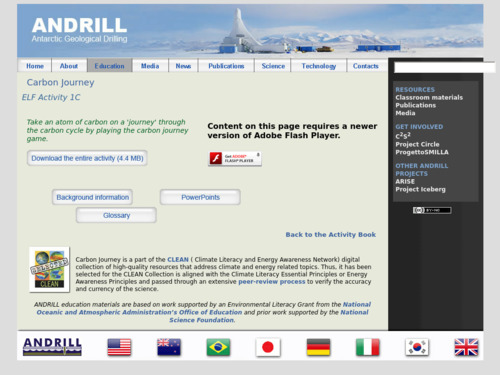 Teachers are encouraged to have carbon journey activity stations ready in advance. PowerPoint should be shown both at the beginning to introduce the concepts and then perhaps again at the end to reinforce the concepts. Additional websites like [link http://www.education.noaa.gov/Climate/Carbon_Cycle.html] might provide ample additional background for teacher and students to clarify misconceptions and take discussion to another level. Carbon journey activity could be completed in pairs to foster discussion and reduce the material costs. In this activity, students model the pathways of carbon through different sinks and sources. UNEP/GRID diagram in the PowerPoint presentation quantifies the carbon cycle nicely. The activity does a first attempt at correcting for residence time. It would be very interesting to show students during the debrief how the numbers that were used for the game compare to the actual residence time. This would be a very powerful and important extension. Comments from expert scientist: This activity covers reservoirs and fluxes of the carbon cycle in a comprehensive way. There is no doubt that this will give students a good idea about how carbon moves around the earth system. The major weakness of this activity is that it gives students an impression that fossil fuels are recyclable. One simple way to solve this is to isolate the fossil fuel reservoir from the rest, and add a constant exchange rate of carbon from fossil fuel to the atmosphere. This activity is a very useful tool for the middle school level to introduce the idea of the interconnectedness of the carbon cycle sources and sinks. The bracelet gives students a tangible example of how carbon is collected or released through the different reservoirs. The design of the activity is very carefully done. The teacher is supported with the necessary materials to prepare the dice. Supporting background information is available for the teacher as well as a short glossary, a PowerPoint file, and a video clip. The scientific foundation to understanding the different stations (reservoirs) and processes should be provided by the teacher after the game to strengthen the knowledge acquired during the game. Both PowerPoint slides and carbon journey activity are well-organized and easy to implement. A glossary with relevant terms is included.